Question:I have a customer who wants her local newspaper (.pdf) published as an native iPhone app. I tried to talk her out of it but she wants it to "be cool, with trend and with fancy page flipping - native iPhone app" (...and who ever pays the bills right :/) Nevertheless, is there an easy one-click solution to bundle the PDF with a simple eBook reader and create a X Code project or native app I can upload to the App Store? Is there any solution on VeryPDF? Answer: According to your needs, there are two solutions for you to choose. One is free solution, you can use VeryPDF Flipbook Maker Cloud API, which allows you to use it as flipbook maker free. By it you can make flipbook from PDF without any fee. But this software can not output app file formats. And the output flipbook can not be kept by URL more than 24 hours by free version. 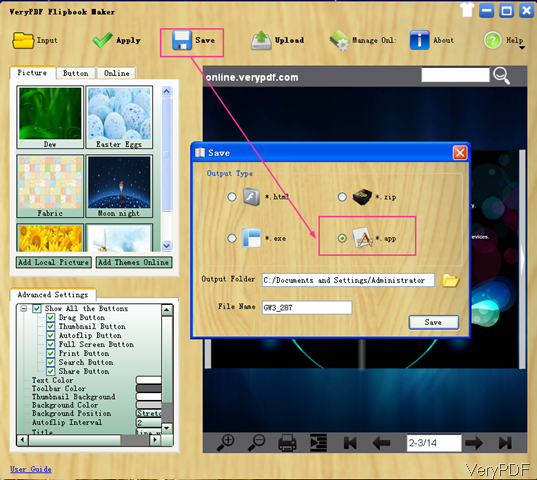 Another solution is a shareware named VeryPDF Flipbook Maker, by which you can make flipbook from PDF and then save it as app. Meanwhile this software allows you to upload output app to App Store. You can choose any one of them solution to solve your problem. VeryPDF cloud application is quite easy to use. In the following part, I will show you how to use the flipbook maker to convert PDF local newspaper to app flipbook. All the VeryPDF software are free downloading and trial, so you can download it to have a free trial without any fee produced. When downloading finishes, it is an exe file. Please install this software by double clicking the exe file and following installation message. When installation finishes, there will be an icon on the desktop. Simply click it then you can launch this software. The following snapshot is from the software interface, please have a check. Step 2. Use this flipbook maker to make app flipbook from PDF. When you use this software, please click button Input to add PDF file to software interface. When finish adding, added file will be shown on software interface. In the left part, you can choose background image, button style, background music. You can choose online button style to apply on output PDF file. In the advanced setting part, you can set which button could be shown on output flipbook. Meanwhile you can also set flip intervals, title and others. When you finish setting part, please click button Save then you will the following snapshot. Please choose app as the output file format and name it. Meanwhile you need to specify output folder. Then click button Save. By this method, you can use this flipbook maker to make app flipbook and then upload it to app store. During the using, if you have any question, please contact us as soon as possible. How can I convert HTML to flipbook? Do you know any tool that can help me read comics on iPhone? How to share flip books? How to read eBooks from PDF just like a regular eBook(like epub files, etc.)? How to make flipbook from scan file? This entry was posted in Flipbook Maker and tagged Flipbook Maker. Bookmark the permalink.